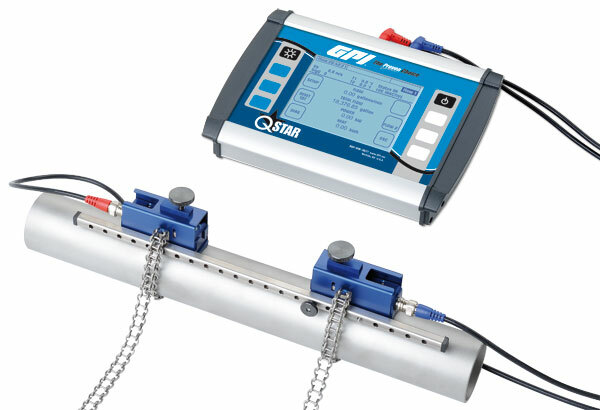 The QMP is the portable QStar Ultrasonic flowmeter model. The use of multiple processors working in parallel means that QStar achieves an extremely high measurement rate. Signal processing takes place in high performance DSPs which are extremely precise and operate at very high resolution. This enables the device to achieve internal resolution of under 0.001 m/s flow velocity. And since the transit time measurement is purely digital, the measurement electronics are virtually drift and calibration-free. The QMF is a fixed QStar Ultrasonic flowmeter model. The use of multiple processors working in parallel means that QStar achieves an extremely high measurement rate. Signal processing takes place in high performance DSPs which are extremely precise and operate at very high resolution. This enables the device to achieve internal resolution of under 0.001 m/s flow velocity. And since the transit time measurement is purely digital, the measurement electronics are virtually drift and calibration-free.